Toronto, ON – The Ontario Hockey League today announced that St. Louis Blues prospect Jordan Kyrou of the Sarnia Sting is the 2017-18 recipient of the Red Tilson Trophy awarded to the OHL’s Most Outstanding Player of the Year as voted by the writers and broadcasters that cover the league. Kyrou becomes the Sting’s first Red Tilson Trophy recipient after finishing third in OHL scoring with 109 points in 56 games including 39 goals while tying for the league lead with 70 assists. His offensive production delivered an impressive 1.95 points-per-game to lead all skaters while captaining the Sting to their best regular season in franchise history with 46 wins and 97 points. “I am truly honoured to receive this award, there are many great players in our league who had great seasons and deserve similar recognition,” Kyrou said. “The last four years with the Sting have been an unbelievable experience with some amazing people. This past season was extra special for me, and I want to thank all of my teammates who stood with me day in and day out, I would not have the success I did without each-and-every one of them. The 20-year-old from Toronto, Ont., was the league’s first player to reach the century mark for points this season achieving the milestone mark in his 50th game on February 27. He generated 31 multi-point performances and was recognized as OHL Player of the Month twice (October and November) amidst the club’s record 14-game winning-streak (September 30 to November 2), and received OHL Player of the Week honours three times (week ending October 22, January 21, February 25). The Jim Mahon Memorial Trophy recipient for Top Scoring Right Winger also tied for the Western Conference lead by appearing among the top three in four different categories of the annual Coaches Poll including tied for first in the Best Stickhandler vote, second Smartest Player, second Best Playmaker, and second Best Skater. 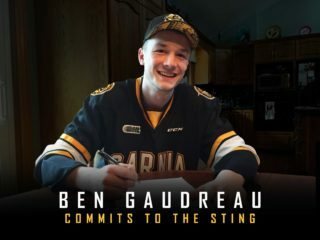 “On behalf of the entire Sarnia Sting organization we would like to congratulate Jordan on this tremendous accomplishment,” said Sting General Manager Nick Sinclair. “Having the opportunity to draft him four years ago and being able to watch him evolve as a player on the ice and a young man off the ice, has been extremely rewarding. Kyrou was originally chosen by the Sting in the second round of the 2014 OHL Priority Selection and was named captain prior to the 2017-18 campaign. He accumulated 290 points in 250 games during his four-year tenure including 99 goals and a franchise record 191 assists. His 290 points stand second in Sting all-time scoring behind only Jon Sim who recorded 311 points in 211 games. This season Kyrou also represented the Sting on the international stage winning gold with Canada at the 2018 IIHF World Junior Championship. 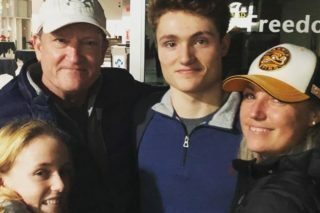 He was chosen by the Blues in the second round of the 2016 NHL Draft and signed his entry-level contract with the club a month following his selection. Accredited media were asked to select their top three choices from the 20 nominees submitted by all 20 member clubs. Players received five points for a first place selection, three points for second place and one point for a third place selection. Kyrou received 235 points in the voting process including first place selection on nearly 40% of all submitted ballots. Philadelphia Flyers prospect Morgan Frost of the Sault Ste. Marie Greyhounds finished in second place with 191 voting points, followed by Ottawa Senators prospect Aaron Luchuk of the Barrie Colts in third place with 165 voting points. The list of former Red Tilson Trophy recipients includes Tod Sloan (St. Michael’s 1946), Stan Mikita (St. Catharines 1959), Yvan Cournoyer (Montreal 1964), Bobby Smith (Ottawa 1978), former Blues Doug Gilmour (Cornwall 1983), and back-to-back winner Brad Boyes (Erie 2000 and 2001), John Tavares (Oshawa 2007), and recent winners Connor McDavid (Erie 2015), Mitch Marner (London 2016), and Alex DeBrincat (Erie 2018). The Red Tilson Trophy winner is the OHL’s nominee for Canadian Hockey League Player of the Year presented at the CHL Awards Ceremony on Saturday May 26 during the 2018 Mastercard Memorial Cup in Regina. Kyrou will also be formally presented with the Red Tilson Trophy at the OHL’s Awards Ceremony on Wednesday June 6 at the Hockey Hall of Fame in Toronto..